Can I follow anyone on Twitter? Most Twitter-accounts can be followed straight away without restriction and you'll see Tweets straight away. Anything inappropriate or not suitable for work will be blocked and could potentially be brought to the attention of monitoring staff. Any accounts that our proprietary system identifies as 'low-credibility' may be placed into a pending-state until approved by your organisation, so may not display until approved. This is most likely to happen if you follow friends and family - stick to professional use and you'll have full access. All incoming Tweets are recorded for compliance with MiFID II. EarlyBird gives you unrestricted read-only access to Twitter. Other sources restrict access to a pre-approved white-list of Twitter accounts. That's like giving you a web browser but saying they have to check every website before you're allowed visit it. EarlyBird gives you complete access, but puts measures in place to prevent misuse. Other sources filter searches aggressively so you only get headline news from major outlets. Everyone gets the same information at the same time. EarlyBird pulls in a much wider set of results, scores them for financial relevance, then lets you choose how to filter. You decide what's important to you. News outlets have to verify news before they publish it. That takes time. EarlyBird gives you the news direct from the source, and we give you the tools to verify it yourself. Other sources shoe-horn Twitter into a generic news feed. You get a watered-down, sanitised version. If that's what you're getting now, you're not getting Twitter. EarlyBird is a professional financial Twitter client. Equities, FX, Macro-Global, breaking news, volume alerts, drill-down, link previews - all built into the design. Why does EarlyBird need my email address? Capturing your email address is part of the compliance protection EarlyBird puts in place so you can have complete access to Twitter. Without it, Twitter needs to stay blocked. EarlyBird is designed for professional use in regulated firms, and regulated firms have a duty to monitor communications, so we record all incoming Tweets for each person that uses EarlyBird. The recording also ensures you can prove a Tweet was in the public domain at the time you acted on it. This is part of the MiFID II Trade Reconstruction regulations. We store each recorded Tweet and your EarlyBird configuration against your email address, so your firm can monitor your use. We don't use it for any other purpose. What is a Hot Tweet? Why are some Tweets shown in red? EarlyBird records recent information about Tweets from individual accounts. This means we can identify if a particular Tweet is spreading more quickly and widely than we would expect. These Tweets are likely to go viral, and we call them "Hot Tweets" and show them with a red background. By clicking on the red "fire" icon (below) in the top bar of your EarlyBird dashboard, you can toggle between showing all Tweets in your currently selected timeline, or just the Hot Tweets. What are folders in EarlyBird used for? Folders can be used to organise the Twitter accounts you follow. Because you can use EarlyBird to follow anyone on Twitter, you may follow different groups of accounts, or want to be able to select information on different topics. All accounts you follow must be in a folder. By default they're placed in the "New Follows" folder. You can create your own folders, and move Twitter accounts between folders. For example, perhaps you follow some journalists - you can move them all to a "Journalists" folder, and then when you're looking for breaking news, clicking on the Journalists folder means the timeline you're shown will include only those accounts in that folder. Folders can contain saved searches and SmartTracks as well as Twitter accounts. EarlyBird allows you to follow Twitter, but it prevents you from Tweeting. The risk of traders Tweeting is the main reason Twitter has been blocked until now. EarlyBird solves that and other compliance issues, and is now in use at around half the major banks. We're working on the other half. The result is full access to Twitter - follow anyone, search anything. But no Tweeting. And it isn't connected to your Twitter account, so nobody (except compliance) can see who you're following. We also provide powerful financial searches across equities, currencies and many global-macro events, where you control the filtering. We call these SmartTracks. These features make EarlyBird easily the most comprehensive and capable financial Twitter tool on the market. Does EarlyBird allow users to Tweet? No. Users are unable to Tweet, retweet or mark "favourites". In fact there is absolutely no outgoing communication. Do users need a Twitter account? No. EarlyBird users do not have a Twitter account, just an account with EarlyBird. We retrieve Tweets from a licensed commercial Twitter feed and distribute them to our users. There is no connection with any Twitter-account. This ensures that no-one outside your organisation can see who your users are following. How does EarlyBird meet compliance regulations? Misuse is prevented by having no outbound communication of any type (ie no Tweeting), no person-to-person messaging, and only pulling in Tweets from unprotected, public-domain accounts. We record all user activity and all incoming Tweet text, so it can be reviewed later. The Tweet recording also enables you to search and reconstruct a MiFID II trade timeline showing the time a relevant Tweet was first displayed to the user. You can configure EarlyBird to put further automatic controls, restrictions and surveillance in place according to your firm's compliance culture. These are designed to require minimal effort from compliance without compromising risk management. The result is that your users get a complete professional Twitter feed that they can individually tailor to build a competitive advantage. We allow Twitter but traders are not allowed to Tweet, what's the problem? You are potentially opening your firm up to major risk of collusion and other market abuse. Recent FX and LIBOR fixing scandals used other forms of chat rooms which have been closed off. Allowing traders to use Twitter.com means they could still engage in this type of activity, because Twitter allows for closed user groups, secret messaging, and deleting Tweets. EarlyBird blocks these risks completely, and it uses a different port on your firewall, so you can enable EarlyBird while blocking all traffic to and from Twitter.com. What is EarlyBird Desktop, how is it different from EarlyBird Web and what's OpenFin? OpenFin is a locally-installed, security-sandboxed run-time wrapper that allows a web app to run as a desktop app on any version of Windows from XP through to Windows 10. EarlyBird Desktop is the EarlyBird app running inside the OpenFin secure wrapper. We recommend using EarlyBird Desktop on Windows rather than EarlyBird Web as it has less window furniture, so takes up less space on your desktop, and it remembers its desktop location and sizing information just like any other Windows app. To find out more, read our blog on EarlyBird Desktop. You can find instructions on how to download and install OpenFin on our Run page. There is further information, including debugging tips and information for IT here. Note that your local IT management may have imposed restrictions on the installation of apps such as OpenFin, or your firm may have its own agreement with OpenFin and require a specific version. If you have any difficulty installing OpenFin or using EarlyBird Desktop then you should speak to your IT department in the first instance. Is there a mobile app for EarlyBird? Yes, there is a native mobile app for EarlyBird. It's available on both Android and iOS. Download the app onto your mobile device from the Google Play Store or the Apple App Store. You will need to log in to the app using your EarlyBird credentials. If you're using EarlyBird stand-alone version then use your email address and password. If you're using EarlyBird in Symphony then you'll need to generate a PIN - in exactly the same way that you obtain a Warbler PIN - and log in with your email address and PIN within 15 minutes of generating the PIN. Any changes you make either in the full dashboard app or in the mobile app - for example following a new account or setting an account to Priority - will be reflected in the other version of your app, but you will need to reload it to see the changes. The interface of the mobile app is very similar to that of the EarlyBird dashboard, except the Settings Cog has been moved to the top bar, and to view folders, SmartTracks and accounts you're following you need to swipe-right from the Tweet timeline. Yes, you should maintain your existing firewall to prevent users accessing Twitter.com directly. EarlyBird users do not require any direct access to Twitter. Will your application work on our locked down network? Yes. EarlyBird just uses standard port 443 HTTPS to connect to https://app.marketearlybird.com or https://symphony.marketearlybird.com . There are no ports to open. In its simplest form EarlyBird runs in a browser, so there's no installation. There's no connection to Twitter.com from inside your network, so you can and should leave Twitter.com blocked to prevent possible market abuse. There are no on-premise server components to install. More complex, richer installations are possible including single-signon, Symphony integration, and a desktop popup manager. But in it's basic form, EarlyBird will run "out of the box". NB we don't actually supply a box. What technology do you use for the client? The main EarlyBird client is a web based HTML5 application that runs in any browser. We have optional components including The Warbler which is a .net task-tray app, and OpenFin / Symphony integrations. In both cases these simply wrap the same HTML5 web app. What is the architecture of the EarlyBird system? EarlyBird is a cloud service running on Microsoft Azure. We use a licensed commercial data feed from Twitter. Each user has client application which communicates only with our cloud service, ie no communication with Twitter. When the user "follows" Twitter account on the app, we start tracking that Twitter account on our data feed (if we aren't already). As Tweets are received on the feed they are stored in our system and distributed to each of our users that have chosen to follow that account. There is an admin / compliance portal. Admin staff can use this to assign licences to end-users, while your compliance colleagues can monitor use and review all Tweets delivered to any individual. What are the licensing options for EarlyBird? Small funds and brokers can purchase an entry level package covering up to ten users, full compliance features, mobile use and optional Symphony / Openfin integration. We are also now providing bespoke enterprise arrangements to the largest sell-side firms where all users get full access for a special price. There is a free version of EarlyBird on Symphony. This is provided to firms who have licensed the premium version for selected users, but need all their users to be able to open Tweets shared internally or externally via Symphony. In all cases the cost includes Twitter content licence fees. OpenFin / EarlyBird Desktop doesn't run, can you help? OpenFin is an independent application used by many major banks and funds to wrap HTML5 apps in a desktop window. It provides a window-like wrapper round the EarlyBird app for a much richer professional experience. We call this combination "EarlyBird Desktop". OpenFin is sometimes blocked, or else locked to a specific internal version. Try running the "Install OpenFin if needed" link on the EarlyBird Run page (top right). You can find more information about configuration and troubleshooting here. If you still encounter problems, please contact us for assistance. Shared Folders are just like normal folders (read FAQ about Folders here) in that they can contain Twitter accounts, saved searches and SmartTracks. However Shared Folders can be seen, and customised, by other EarlyBird users. Some Shared Folders may be set up inside your organisation, and shared only with other users in your team. Other Shared Folders are set up by EarlyBird and are shared with all other EarlyBird users. When you follow a Shared Folder you can customise your version, for example by removing accounts or adding a SmartTrack, without affecting the contents of either the original folder or the contents of any copies being followed by anyone else. You can see the Shared Folders accessible to you, as well as your own private folders, by clicking the folder icon in the top bar of your EarlyBird Desktop. You will see tabs for EarlyBird Shared Folders, Team Shared Folders, and Your Folders. Shared folders you follow will appear in the same Folder list as your own folders, and will be identified by an asterisk following the folder name. Tell me more about EarlyBird SmartTracks and EarlyBird Collections. As well as individual Twitter accounts, you can also take advantage of our SmartTrack-powered Twitter searches for companies, topics and currencies – these cast a wide net across Twitter to bring you only financially relevant Tweets for the things you’re interested in, often finding important, actionable Tweets other Twitter clients miss. You can also set the level of filtering for each one. You can view all available SmartTracks by clicking the lightning bolt symbol (below) which you'll find in the top bar of the EarlyBird dashboard. We also offer EarlyBird Collections – lists of Twitter accounts grouped by topic (such as UK politicians or UK financial media) that you can follow in a single click, allowing you to grow your news sources in seconds. You can find both EarlyBird Collections and SmartTracks in the Who's Who List. Why can't I see EarlyBird in the Symphony Market? Your Symphony administrator needs to enable it for you. If you don't know who they are please get in touch and we'll follow this up on your behalf. What's the difference between Free and Premium versions? The premium version gives you all the features of EarlyBird including desktop alerts and mobile use. You can follow anyone, and have full access to SmartTrack intelligent financial searches. The free version is restricted to following a handful of Twitter accounts, and searches are strictly limited. It isn't intended for frequent professional use. The free version is made widely available so if a Premium user shares a Tweet via Symphony, the recipient can view the complete Tweet including pictures and links. Without it, Symphony can only show the basic Tweet text. Both versions are recorded for full MiFID II compliance. How do I enable Symphony single-sign-on? The EarlyBird-Symphony integration supports single-sign-on by having Symphony transfer the user's email address to the EarlyBird client via Symphony's partner authentication system. You don't need to set up anything technical. All you need to do is to authorise this transfer of email address from Symphony to EarlyBird. Please contact us and we'll provide the appropriate authorisation form for you to complete. This is the recommended solution for production roll-outs. Without this, the user must enter their email address on first use, and validate it with a one-time code sent to that email account. Is there any difference between the Symphony version of EarlyBird and the Stand-alone version? There is no functional difference between the Premium version of EarlyBird in Symphony and the stand-alone version of EarlyBird. EarlyBird in Symphony obtains your credentials from Symphony, so there's no need to log in or otherwise authenticate yourself to use EarlyBird provided it's been provisioned and you've been enabled by your Symphony administrator. You will need to log in to use the Warbler on your desktop - because this runs independently of both EarlyBird and Symphony. See the relevant FAQ. And, of course, because EarlyBird for Symphony runs within the Symphony messaging app, it's really easy to share interesting and relevant Tweets with other Symphony users. How can I inject Tweets into Symphony Chats? You can get Tweets injected into Symphony chat rooms in real time. The EarlyBird TweetBot will announce itself in the chat room and request "activation". The TweetBot will respond that it is ready to inject Tweets. For real-time Tweet injection use the main EarlyBird app to choose Twitter accounts as described below. Select Add to Symphony Chat Room. You'll only see the chat rooms you are an administrator for. Whoever did the activation becomes the administrator for that chat room, and can add Twitter acccounts. That person can add more administrators so several people can add or remove Twitter accounts. They will then see that chat-room in their list in EarlyBird app. Click the cog icon on any Tweet, or on the /earlybird help response. Who can read Tweets in a chat room? Anyone with a premium EarlyBird licence will see the full text of the Tweet. If they have a free licence, or no installation of EarlyBird, they won't be able to read the Tweet text. Viewing Tweets on the Symphony mobile is currently only possible with an enterprise licence. The EarlyBird Warbler is an optional plug-in for your task-tray where it runs discreetly in the background, showing you Tweets via on-screen popups even when EarlyBird is not running. Warbler is particularly useful on trading screens where space is limited. Warbler is a stand-alone app. It runs entirely separately from EarlyBird, and doesn't require EarlyBird to be running on the same machine. 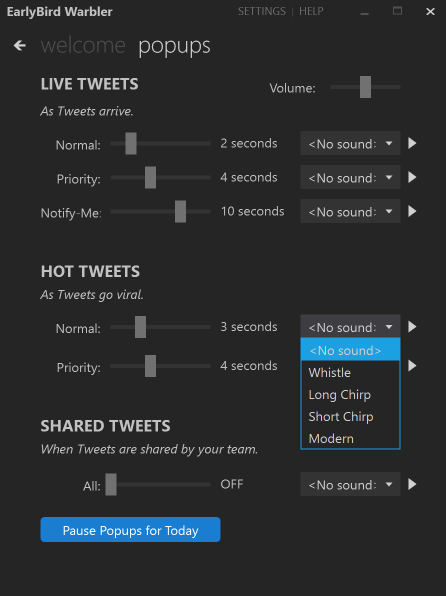 You can position your Warbler popups to appear anywhere on your screen, and you can configure which types of Tweets are shown in Warbler popups, how long they remain visible and whether Warbler plays a sound notification for each popup. In order to log in to Warbler you need to associate it with your EarlyBird account. This is done by entering your email address along with a PIN which you generate in your EarlyBird dashboard. Warbler runs only on Windows systems. It's not available for MacOS or Linux. How do I generate a PIN for the Warbler? To enable the EarlyBird Warbler you need to associate it with your EarlyBird account by generating a PIN in your EarlyBird dashboard and entering (or copying & pasting) it into the Warbler dialog. Run up your normal EarlyBird app and log in as usual. Click on the Settings Cog in the bottom bar, select the Popups tab and then click the "Generate PIN" button. Clicking "Warbler Inactive" in the bottom bar takes you to the same place. Now enter your email address and this PIN into the Warbler and you'll be logged in. You should enter your PIN into Warbler within 15 minutes of generating it or it will expire and you'll need to generate a new PIN. Each PIN can only be used once. When your PIN has been verified, a secure token is stored on your machine. This is checked each time the Warbler is run to confirm that the user of the machine (you) is licensed. The token cannot be transferred to another machine or user. I've just changed my EarlyBird password. Do I need to generate a new PIN for Warbler? No, you shouldn't need to generate a new PIN for Warbler even if you delete and reinstall it. The PIN associates your Warbler instance with your EarlyBird account but is independent of your password. You will only need to generate a new PIN if you install the Warbler on a different machine. How do I change which Tweets are shown by Warbler? To open the Settings menu for Warbler, right-click the Warbler icon in your task-tray and select "Settings". Click the grey "popups" tab and you will see this settings dialog. Use the sliders to adjust the display time for each type of Tweet. Moving the slider entirely to the left turns that type of Tweet off, and moving it entirely to the right will cause each popup for that type of Tweet to remain on screen until you click on it to dismiss it. And if you want to irritate your colleagues you can turn sound notifications on for some or all types of Tweet! As you can see, by clicking the blue button at the bottom you can pause your Warbler popups for today. They will resume at midnight GMT. How do I uninstall the Warbler? To uninstall the Warbler right-click the Warbler icon in your task-tray and select "Exit". To run the Warbler again you'll need to reinstall it. If you've previously installed and authenticated Warbler with a PIN on this machine you won't normally need to re-authenticate it as the secure token will be retained. If you are prompted to login then simply re-authenticate Warbler with your email address and a PIN as explained in the previous Warbler FAQs. How do I install the Warbler? To install the EarlyBird Warbler on your Windows machine, go to https://www.marketearlybird.com/run, scroll to the bottom of the page and click the "Install EarlyBird Warbler" button. Your browser will ask you what you want to do with the setup.exe file. Select "Run" and the Warbler will be installed in your task-tray. If you have previously run the Warbler and entered a PIN then it will simply log you in. If this is the first time you've installed the Warbler then you'll need to generate a PIN to authenticate yourself. See the relevant FAQ. What are Popups, and are they different from the Warbler? Popups are Notifications of Priority Tweets, Hot Tweets and Shared Tweets that are shown in the Notifications area on your system. These are useful if you normally hide your EarlyBird dashboard but still need to be notified if something significant happens. How Popups work depends on your browser - the display and location of Notifications may be different for different browsers and operating systems. You should ensure that your browser allows app.marketearlybird.com to send Notifications - you can do this in browser settings. You can turn on, and configure, Popups in EarlyBird by clicking the Settings Cog icon in the footer bar of your EarlyBird dashboard and selecting the Popups tab. Once you've turned on Popups for one or more types of Tweet you can toggle them on and off with the appropriate icons in the footer bar of your EarlyBird dashboard. Popups are basic Notifications. Their appearance, location and sounds are determined by operating system. If you're running Windows and you'd like more sophisticated notifications with control over where they appear, how long they are displayed, and which sounds are played, if any, then you should install the Warbler. Enabling the Warbler disables Popups. Note that Safari on MacOS in defaults to not allowing apps to generate Notifications. If you want to change this, go to Preferences in Safari, select the Websites tab and click the Notifications icon. If you've run EarlyBird and have clicked the Popup Preview, you should see app.marketearlybird.com listed as having tried to request Notifications. Change the setting from "Deny" to "Allow" to enable EarlyBird Popups when running EarlyBird in Safari. These will appear as Notifications in your Notification area. What's the Who's Who List? The Who’s Who list is our online library of financially relevant Twitter accounts. You are not restricted to this list in any way, it's just there to help you find the accounts that are going to give you a competitive advantage. The list covers all asset classes, politics, economics, macro-global events, mainstream and emerging markets, and every major news outlet. When you search the Who's Who list it will first highlight accounts we've selected. It will then search further across the whole of Twitter to find what you're looking for. If you click the Who's Who button on the app it will synchronize with your EarlyBird app. Drag Twitter accounts onto folders and your EarlyBird app will update automatically. How do I find and follow SmartTracks and Collections? Individual accounts - shown in a blue tile. These are individual Twitter accounts associated with one of the sectors and topics shown in the top left. To follow Individual accounts you can search for them, either from the EarlyBird dashboard or the Who's Who page, and then click "Follow" then select a folder into which to put them. Alternatively you can navigate to a sector and topic on the Who's Who page and scroll through the accounts of individuals we've identified that Tweet on that topic, clicking "Follow" and picking a folder on each you find interesting. Follow all the accounts in a collection by clicking "Follow" and selecting a folder. You can expand the list by clicking on the grey button above the "Follow" button. SmartTracks are shown in the Who's Who List after any Individual Accounts. They're shown in orange & yellow tiles with the SmartTracks icon (below). Follow all the accounts and the complex searches in a SmartTrack in the same way as a collection: click "Follow" and select a folder in which to put it. Does this list contain all the Twitter accounts I can follow with EarlyBird? The Who's Who List merely contains our suggestions of where you might like to start with Twitter accounts for your particular interest. You can follow almost* anyone, any Twitter account. So you if you know about a Twitter account that gives early news on stock moves, or on oil futures, you can absolutely follow them and not share them with anyone else. Who's Who is just a good place to start, to avoid having an empty Twitter stream. * The administrator in your organisation can set minimum requirements for the number of followers and/or the age of a Twitter account for you to be able to follow it. Call us on +44 (0)207 100 4489 for #help.